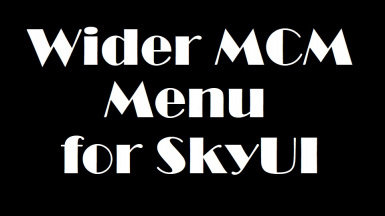 This mod provies wider MCM menu interface of SkyUI to prevent mod titles text clipping and clipping inside MCM menus. Initial version. All fixes of SE version included. 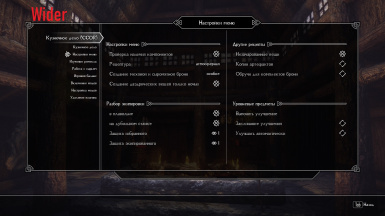 Some mods with MCM menus may have pretty long MCM titles. So the mod name or settings category name may clip through the left menu border, especially with font replacers. Also it may happen with translated versions of mods. Maybe you want to re-name some mod titles via ESP Translator or similar tool for more convinient navigation. And your new titles is too long and clip through the border. Or you just don't like the standard narrow list of MCM titles. 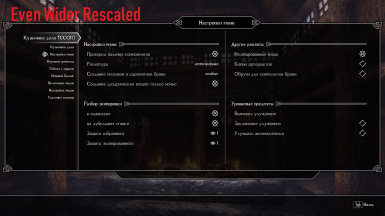 [updated with 1.0a] Or you have text clipping inside MCM menus. This mod is not for everyone, most of you simply don't need it. It's just a single swf-file replacer for the latest SkyUI version.